The Big Lunch is the UK’s annual get together for neighbours. A simple act of community, friendship and fun. Great for neighbourhoods, perfect for building community spirit… but good for business? Yes it is, especially when businesses encourage their employees to get involved — in their own neighbourhoods, and within the workplace. Holding a Big Lunch in the workplace means sharing good food and good company in a relaxed environment, which allows employees to get to know each other. Big Lunches can be themed — say, everyone brings a dish from around the world — or can include events, such as getting into teams for an ‘Office Olympics’ — or they can be laid back affairs where mingling is the focus. A break from work and the chance to form friendships boosts morale and workplace satisfaction. It helps reduce loneliness, fosters goodwill and builds stronger relationships between colleagues. “Our team love getting together and taking part, and getting to know the people working at the businesses around us better. Usually we do a ‘bring and share lunch’ but this year we provided the catering and asked people to donate the cost of a meal deal (£3) to our chosen charity. It always gives our team a chance to bond with people they might not work with all the time. It gives them space to relax and come together.” – L. Wilson, We are Vista. When people feel happier in their work and in their home life (and people do tell us they get a boost of the feel good factor after a relaxing day getting to know neighbours, making friends and enjoying good food), they are 12% more productive. That’s like an extra hour of work accomplished each day. It equates to £18 billion for the UK economy. Earlier this month, The Co-op launched their findings on the impact of loneliness to business, and the research found a staggering £2.5 billion cost every year (the hit to the private sector makes up £2.1 billion). Of the UK’s population, 3.3% are severely lonely; this is 1 million working adults. Alongside the New Economics Foundation who conducted the research, The Co-op argue that strong social relationships are fundamental to people being able to lead good lives. When being lonely prevents people living a good life, they’re more likely to leave their job earlier, take more sick leave, become unhealthy (mentally and physically), and to be far less productive in their job. Currently the private sector is sacrificing £82 per worker, per year because of loneliness. 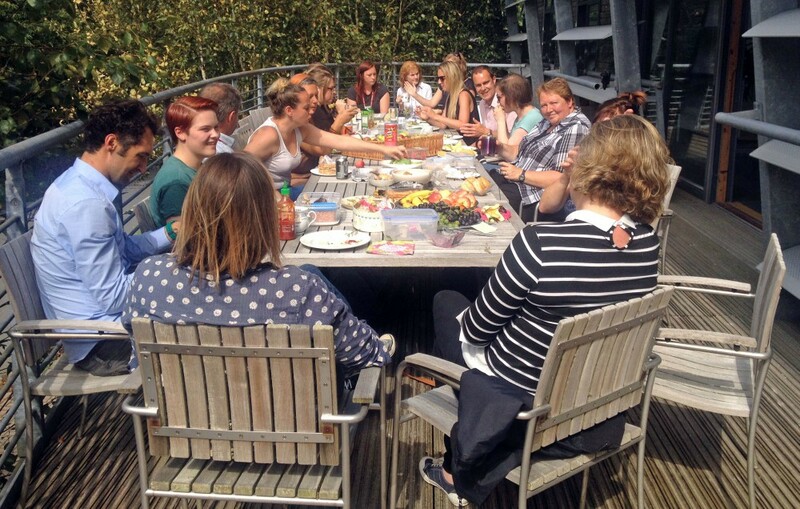 If you get chatting to the man or woman on your street who’s organised The Big Lunch, and he or she tells you that their workplace encourages it — even offers a day of annual or voluntary leave for employees who take part — then chances are you’re going to be impressed with that company. It tells you they care about their employees, they care about communities, and that they’re probably a fun place to work. You’ll leave that conversation thinking favourably about your Big Lunch host’s business — it seems friendly. You’ll probably tell people how great it is when it comes up in conversation. You may even be more inclined to spend your money with that business. If you catch up with that neighbour again, you’ll probably ask more about work and what they’ve been up to, becoming more and more familiar with the organisation. Many workplaces offer one or two days’ leave for their employees to take as ‘volunteering days’. If employees take a day off to help plan and set up their Big Lunch, or claim back the day of the Lunch (likely held on a weekend), then workplaces can report on the increased uptake of voluntary hours and time given back to the community. What’s more, over 60% of people who hold Big Lunches want to go on to do more good things for their community. It’s like a snowball effect for community goodness, and this is a good thing for sustainability and citizenship reporting. What’s more, many Big Lunchers choose to fundraise for a hyper-local cause: a defibrillator for the street’s phone box, a new swing set for the local park, or a contribution towards a neighbour’s hospital treatment. We know that some businesses will match their employees’ fundraising, and this creates further incentive for employees to help make positive changes where they live. Tempted? 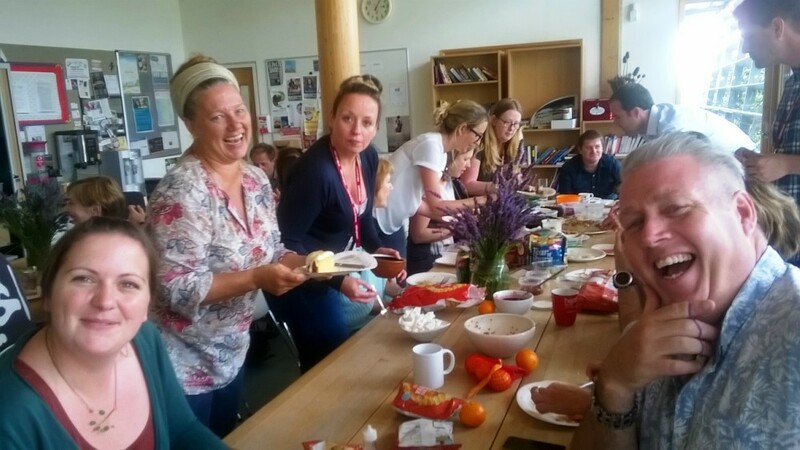 Have a look round The Big Lunch home on our site, and if you’d like to chat more about promoting The Big Lunch in your business, please get in touch with us — we’d love to work together in helping your colleagues get to know each other and their own neighbours. You can also encourage employees to sign up for a free Big Lunch starter pack, which we’ll post straight to their door. The Big Lunch weekend this year is 1-2 June. Businesses can get involved by hosting events: Big Lunches, sporting and cultural events, open days, or by supporting local community events through offering venues, assets and funding. Get in touch for more ideas!